Renew friendships, revitalize your faith and explore winter at camp. How is God making things new through the winter season and within our lives? 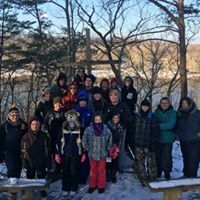 We will sled (if there is snow), hike, craft, worship, zipline and enjoy other favorite camp activities. There’s nothing like a campfire with s’mores and hot chocolate! Summer staff and volunteers will return to lead your adventures. Come to see old friends or bring a new friend with you! Hope to see you there! Fee includes 2 nights lodging, meals beginning with Saturday breakfast through brunch on Sunday, snacks and all activities. Friday check in will be between 6-7pm with pick up Sunday at 11:30am.